This tutorial demonstrates how an application gets an Auth'n'Auth token for a user. Auth'n'Auth – The traditional authentication and authorization technology used by the eBay APIs. OAuth – An industry standard authorization technolocy that is supported by many eBay APIs, including several of the traditional eBay APIs. This tutorial covers how to configure and use Auth'n'Auth. For details on using OAuth, including which tradtional APIs that support OAuth, see: OAuth access tokens. The first step is the preparatory setup that enables an application to receive user tokens. This setup is done on the eBay Developers Program site (developer.ebay.com). The application makes several API calls to eBay during the process of getting a token. When a step includes an API call, it provides a link to XML call samples in the Trading API Reference. The samples show how to perform those steps using the API. The API Flow tutorials use raw XML requests and responses. The XML call samples described in this tutorial can all be found in the Trading API Reference. 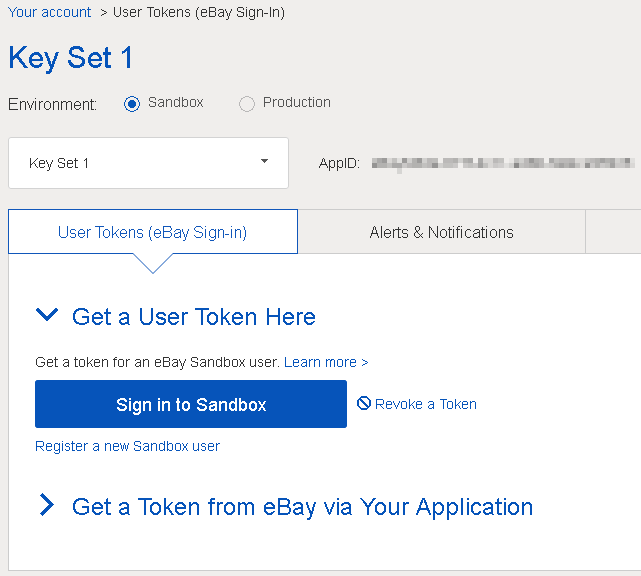 Join the eBay Developers Program and get your application's Sandbox keyset. Create your own Sandbox test user, equivalent to the testuser Magical Bookseller used in this scenario, with a Sandbox authentication token. See Creating a Test User in the eBay Features Guide for more information. Have an application that can respond to web-based user actions and receive responses to calls it makes to eBay servers. The tutorial has no specific code requirements. After you log in, you can run the XML samples in the API Test Tool on the eBay Developers Program website. Typically, an application needs to be set up to receive tokens only once. The following is for Web/Server based applications. For information about Client/Desktop applications, see Client/Desktop Applications. This section shows how the developer of MagicLister uses the screens on the Application Keys page to generate an eBay redirect URL name that MagicLister will use in the token generation process, and configure the eBay consent form that MagicLister's subscribers will use to grant MagicLister tokens. The developer signs in to https://go.developer.ebay.com and goes to his Application Keys page. The Sandbox environment is used for testing, and the Production environment is used to set up an application for eBay users. In this example, we used Sandbox. In the App ID row of the Sandbox keyset, the developer clicks User Tokens to access the Tokens page for your Sandbox keyset. He clicks Get a Token from eBay via Your Application. In the Your eBay Sign-in Settings section, he clicks Add eBay Redirect URL. Display Title: the company or application name to be displayed on the consent form. Your auth accepted URL: the URL to which users will be directed after they consent to the web application authenticating them. This URL must support SSL and must use the HTTPS protocol. If your application is capable of serving web pages, you should provide your own web page and set this URL. If your application cannot serve web pages, this URL defaults to a standard eBay accept-response page (the eBay page and URL are subject to change by eBay). Your auth declined URL: the URL to which users are directed when they do not consent. If your application is capable of serving web pages, you should provide your own web page and set this URL. If your application cannot serve web pages, this URL defaults to a standard eBay accept-response page (the eBay page and URL are subject to change by eBay). When the developer is satisfied with the redirect URL name settings, he clicks the Save button. Add Image: click the icon and upload a logo image to be displayed on the consent form. Acceptable formats for application logos include JPG, GIF, PNG, BMP, and TIF image files. JPG is recommended. If you use PNG, it will be converted to JPG (or GIF) format. The maximum file size is 7MB. eBay Picture Services (EPS) downscales and compresses the picture to store it at the different sizes in the imageset. For best results, upload a picture that has a minimum of 1000 pixels on the longer side. You can upload multiple images, but only one can be selected to display on the consent form at a time. About URL: the URL at which users can learn about your application. Enable Application Branding: check this box to use the selected logo image and the About URL on the consent form. After making changes, the developer clicks Save Branding. The MagicLister application is now set up to start getting tokens. How the seller, Magical Bookseller, interacts with the application site and the eBay site to grant a token to the application. How the application, MagicLister, fetches the token. Magical Bookseller goes to the MagicLister site, where she clicks a Subscribe button or otherwise lets the application know that she intends to use it. MagicLister sends a GetSessionID call to eBay, with the MagicLister redirect URL name. This call will retrieve a SessionID that will identify Magical Bookseller after she signs in to eBay. For an example of the GetSessionID request and response, see the GetSessionID samples. 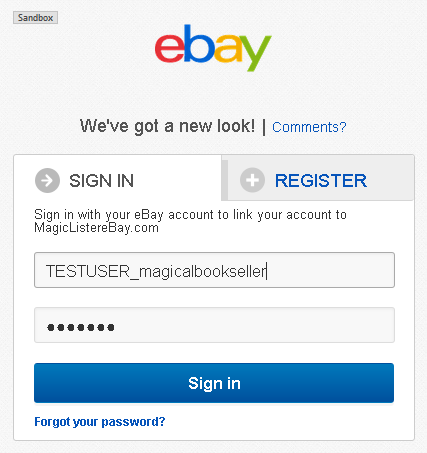 MagicLister URL-encodes the SessionID and then constructs a URL containing the SessionID and the redirect URL name, and uses this URL to send Magical Bookseller to the eBay Sandbox sign-in page. In this scenario, the GetSessionID call was made using the API Test Tool, and the SessionID was pasted into a URL along with MagicLister's redirect URL name, in a browser window. Magical Bookseller signs in to eBay. eBay sends Magical Bookseller to the user consent form that MagicLister configured in the application settings tab, in the first section of this scenario. When Magical Bookseller clicks the I agree button, eBay sends her to MagicLister's "auth accepted" URL. When Magical Bookseller arrives at the "auth accepted" URL, MagicLister sends a FetchToken request to eBay with the SessionID to retrieve the token, as shown in this sample. MagicLister includes its credentials in the HTTP header with this FetchToken call — the App ID, the Dev ID, and the Cert ID. That's because this is one of the few authenticated user-related calls that you make when you don't already have a token. Note: With most other calls, instead of the keys, you include the token in the RequesterCredentials container. If you're using SOAP, RequesterCredentials needs to be in the SOAP header; for XML you include RequesterCredentials in the request payload. For more information about how this works, see Security on the Trading API's Making a Call page. FetchToken returns a user token for Magical Bookseller to MagicLister. MagicLister saves the token and the token expiration date from the FetchToken response. MagicLister tests the token by making a GeteBayOfficialTime request using the new token. Try other calls for the user: Listing an Item, Buying an Item, or Completing a Sale. Try the procedure with your application in Production: create a test user, subscribe it to your application, and get a token for the user. Copyright © 2009–2015 eBay, Inc. All rights reserved. This documentation and the API may only be used in accordance with the eBay Developers Program and API License Agreement.